I know. That’s a weird a question to be asking of myself. Florence was beautiful. When my eyes hit that duomo, I felt astounded. It was magnificent. And then there was the food, the sunsets, the way the bridges reflected against the water, and just the art everywhere. So how could I not love Florence? How could anyone not love Florence? And am I just crazy to be asking myself this question? Everyone who’d been to Florence told me how amazing it was. How much they loved it. But yet, after just a day or two, something wasn’t clicking for me in the way I expected it to be. I feel so bad writing that. Because I am an American. And I was a tourist there. So I was contributing to the same problem. So I feel like such a snob (or worse) for even stating it out loud, but there it is. So why did the American tourists bother me so much? I think it comes down to just a couple of reasons. And two is that it seems to be a large study abroad destination for Americans. And since we were there in November, there were a lot of them about. But that number wasn’t even the key thing. But it just made the following reason more noticeable. Every American we saw (and I literally can think of no examples otherwise) just assumed that all Italians spoke English. None of them, not once, attempted anything in Italian. Yes to the obvious question here. Most Italians in Florence do speak English. English is kind of a default language. When my Portuguese co-worker went to Austria, he got by by speaking in English most of the time. So I get it. Yes they speak English. But what about trying to say something, anything in Italian. Like hello. Or how are you. Or thank you. Or goodbye. Or a table for two, please. All are pretty simple and easy phrases to learn. Ryan and I both learned how to say all of the above. We also learned how to order a glass of wine. How to say “this one.” And how to get the check. These were not hard things to learn. A few days of practice beforehand and you could learn some basic Italian. Because to me it’s not that they just know English. It’s about making the effort. It’s about thinking hey I’m in Italy, I choose to travel to Florence, and most people speak Italian here so I’ll try to show them some respect. That’s why I learn a few words. Most Italians would answer in English when I tried the above. And who knows? Maybe they were annoyed I even tried to speak (butcher?) their language. But I like to think they were proud of me for learning and trying. Which was the exception that we saw. Sitting at a wine bar, American after American came in and just ordered wine in English. Never once trying to speak any Italian. Not hello. Not thank you. Not anything. They would come in and see this obvious looking Italian man in the Oltrarno neighborhood (which is supposed to be more of the local one) and just order a glass of wine like you would in the States. Ugh as you can see, this really bothered me. But what bothered me the most was the American foreign exchange students. We visited at the end of November. Most of those students had been living in Florence for a good couple of months. And I again never heard any young American even try to speak any Italian. When I was in Ireland I almost took a Gaelic class. (It ended up clashing with a class I had to take so I couldn’t.) But I thought it would bring me closer to the culture. The culture I decided to live in for 6 months. And gaelic isn’t even widely spoken in Ireland! But I almost took a class to learn it! So these students had come to Italy and with a month left, none of them felt comfortable speaking anything in Italian? Again, not even the basic “hello” or “thank you.” Because I get it, I don’t expect anyone to be fluent. But what about just saying thank you in Italian? This really, really bothered me. But we eventually got over it. I tried my best to speak the little Italian I knew. I tried to be extra courteous and extra friendly in response. And who knows! Maybe my attitude bothered the locals more. But I can only go by what I felt. And these are the reasons I felt…off about Florence. But in the end, as these things begin to fade from my mind, I’m left with the good. The duomo. The food I ate too much of. All the stairs I climbed to get to those great views. And a statue that literally took my breath away (you know the one). It was a city that literally astounded me it was so beautiful. So maybe I do (and will) love Florence. But I just needed to get that off my chest first. I had a very similar feeling about Florence. My husband and I spent 2.5 weeks in Italy with Florence being one of our first stops, but it was not my favorite. The sights – the Duomo – beautiful! The city itself did not sell me. 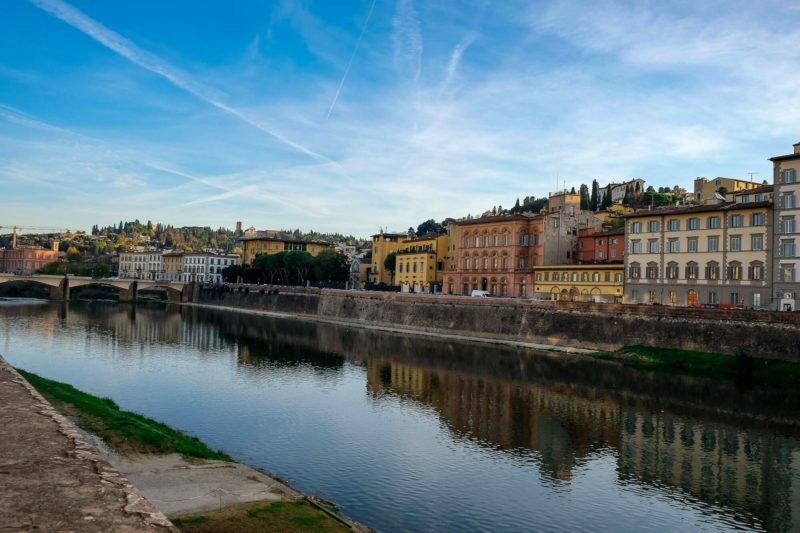 It heaved with tourists and was hotter than Hades in August (we DID know what we were getting into), but because of all of the green tourists, Florence lacked its luster, whereas other cities, enchanted me. Thanks for a great blog post! I’m glad I wasn’t the only one. When I visualize our times in Florence, it was beautiful and we did find our rhythm. But it just lacked that something for me that spellbound so many others. Thanks for reading!